Site Description Firth of Lorn: Covering an area of ~210 km2, the Firth of Lorn Marine Special Area of Conservation has been designated for its rocky reef habitats. The rocky reefs support an exceptional marine biodiversity, with associated communities and species that are amongst the most diverse in both the UK and Europe. The area enclosed by the Firth of Lorn marine SAC boundary contains a complex group of islands, sounds and inlets. Within the boundary, the Gulf of Corryvreckan, Bealach a’Choin Ghlais (Pass of the Grey Dogs) and the Sounds of Clachan, Cuan and Luing are some of the most outstanding tide-swept areas in the NE Atlantic. It is the varied tide-swept nature of the site, from exposed sounds to wave sheltered bays that contributes to the rich biodiversity of the area. The rocky reefs extend from the shore to considerable depths in many places. Reasons for Designation: Rocky Reef Habitat and Communities. The rich and diverse marine communities supported by the littoral and sublittoral rocky reefs of the Firth of Lorn reflect the varied physical environment of the area. These range from reef communities characteristic of wave and current sheltered conditions to those influenced by extreme tidal conditions. In between are areas moderately exposed, where the greatest variety of fauna and flora is found. 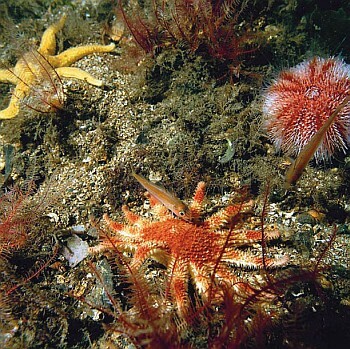 These communities include species normally characteristic of deeper water, such as the sponges Mycale lingua and Clathria barleii, and the feather star Leptometra celtica. There are other species considered scarce and several with either a northern or southern distribution, many reaching their geographic limits in this area. For example, the southern cup coral Caryophyllia inornata, the nationally rare brittle star Ophiopsila annulosa and the northern bryozoans Bugula purpurotincta and Caberea ellisii. Of particular interest is the rarely recorded sea fan Swiftia pallida and associated sea fan anemone Amphianthus dohrnii, which is unusually widespread in the Firth of Lorn area. In the strongest tidal streams communities are restricted to crevices and areas in the lee of the tide. In the Gulf of Corryvreckan, open rock is dominated by the oaten pipes hydroid Tubularia indivisa and the barnacles Balanus crenatus and Chirona hameri, species indicative of a highly scoured environment. Also of note in these relatively deep, tide-swept areas is the presence of species normally considered characteristic of shallow surge gullies, such as the gooseberry sea-squirt Dendrodoa grossularia and the lace sponge Clathrina coriacea, and species typical of much more wave-exposed, open coast sites, such as the jewel anemone Corynactis viridis and the northern starfish Leptasterias muelleri.